Postage stamp collecting and dealing began shortly after the very first stamp was printed in England on May 2, 1840. 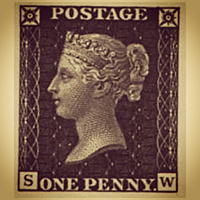 This mystic stamp is known as the Penny Black the stamp bares the image of Queen Victoria; it was an instant hit. With 68,808,000 Penny Blacks being printed, you can still easily find one today to add to your collection. Because of the Postal Service and stamps, communication from one country to another became a part of everyday life. It also brought a sense of excitement as one would wait for each letter to arrive with a foreign postage stamp and post mark from across the sea. By 1860, thousands of collectors and dealers popped up around the globe. Europe, Asia, America and the rest of the world opened their own postal services and began printing their own designs that best represented what their country stood for at that time. On July 1,1847 the United States issued it’s first postage stamps. This was a red-brown five cent Benjamin Franklin (America’s first postmaster general) and a black ten cent stamp of George Washington. 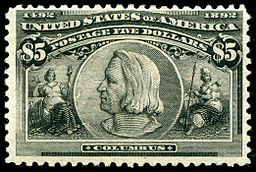 The Franklin stamp was good for a distanced under 300 miles and had to weigh less than one ounce, and the ten cent Washington was good to travel the distance past 300 miles. By 1861, the post office had become so successful that congress dropped the rate to three cents; this is where it stayed at that rate for almost 30 years. By the late 1800’s, when stamp collecting began its run as the worlds most popular hobby, the Post Office began printing stamps that were not only going to be used for postage, but were also going to be very appealing to collectors as a way to increase their profits. On January 2nd 1893, they released the 16 stamp set of the Columbian Exposition series commemorating the 400th anniversary of Christopher Columbus’s discovery of America, and as it turned they were right. Although collector’s were unhappy about the price of the set, which all together totaled $16.34 the set still was a hit and drew even more attention to the hobby of stamp collecting. As time passed in the early part of the 20th century, collecting stamps quickly turned into collecting everything else that had to do with postage stamps or the postal service. Collectors sought letters, specific countries, airmails, first day covers, revenues, post marks and the hunt for the rare error on the stamp that had collectors breaking out their magnifying glasses. By the mid 1950’s, it had not only turned into the worlds most popular hobby, but it was also being used as a tool for parents to teach their children about everything from geography to colonization. Some one once told me you can learn just as much about world history from postage stamps as you can from sitting in a history class. And after all these years of dealing and collecting stamps I would have to say that I have learned even more.